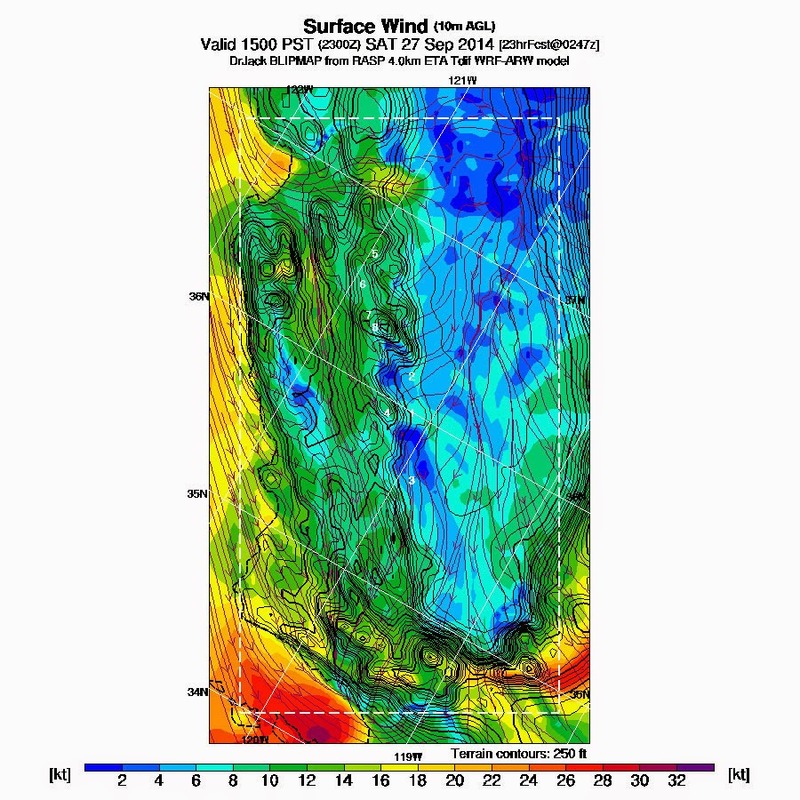 Wind: mostly 3-5 MPH, most gusts under 9 MPH, peak gusts of 14 MPH recorded. Time Aloft: Morgan 4+? hours, Ethan Ronat, 4.5 hours. Temperature: Maximum of 78º F.
After long, hot summer, the 79ºF forecast for today sounded just great. The RASP for Avenal is actually looking pretty good for tomorrow for this time of year. 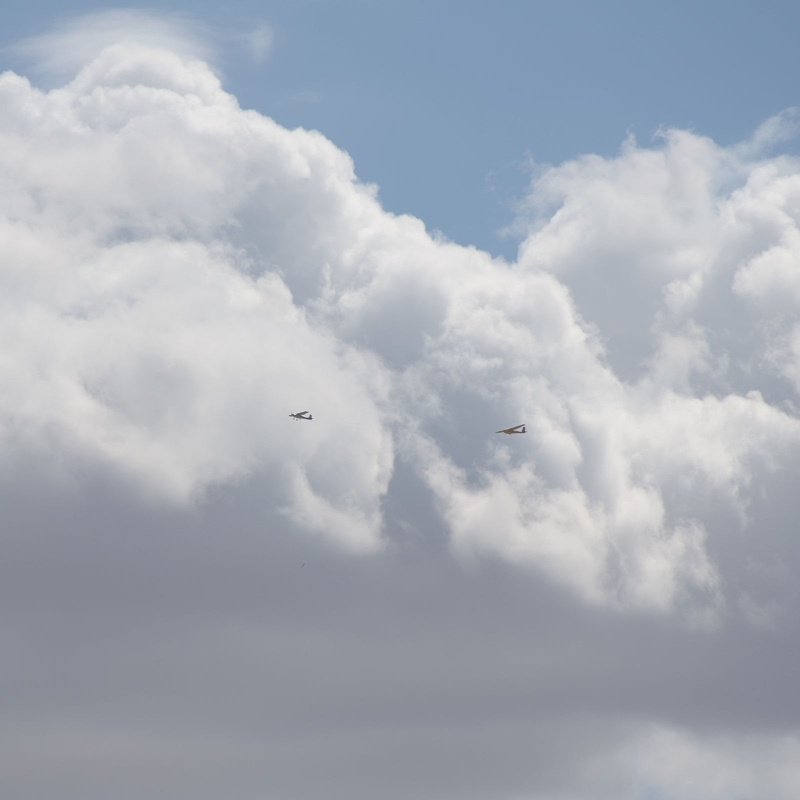 It''s indicating thermals to over 6000 MSL right over the field and that there should be cumulus clouds. 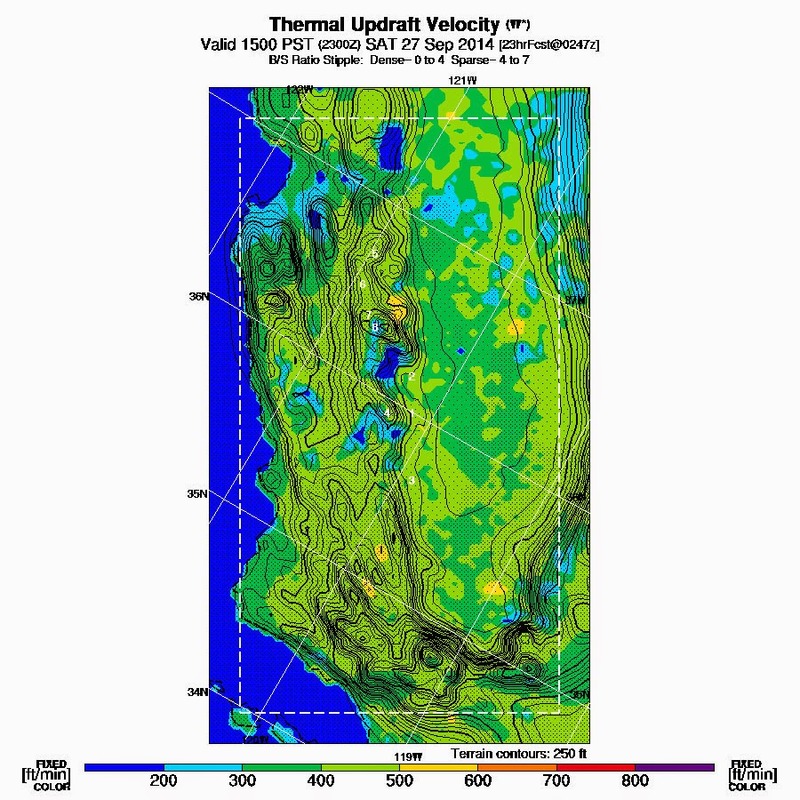 This loop show the Sept. 27 2200Z Critical Updraft Strength prediction as it changed during the preceding days. 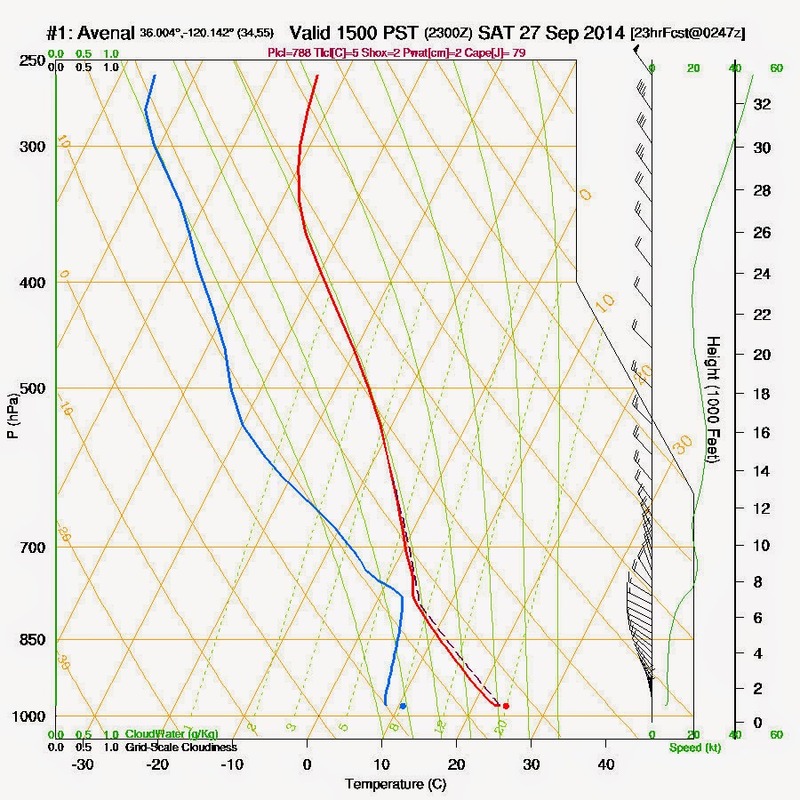 Above: 4 successive predictions of Critical Updraft Strength at 2200Z (3PM) Saturday, September 27, 2014. 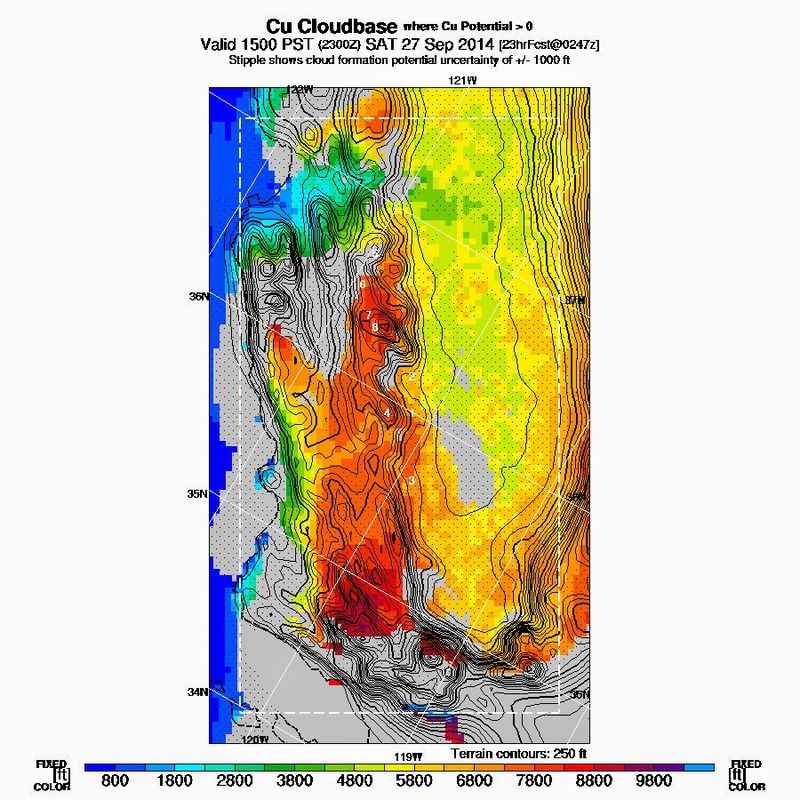 Alex continued, "Cloud bases as high as 8000 + MSL over the Diablo range." Alex also said there could be one small problem, "Main negative is there will be some wind, up to 15 kts average surface wind, but does not look severely windy." As it turned out, the peak gusts for the day recorded by the National Weather Service equipment at the school across the street were only 14 MPH, and they were few. Getting closer to tee-time, these two satellite images taken at 1500Z and 1530Z (8AM and 8:30AM) that morning show it could be an interesting day. The sky was nice to look at today. 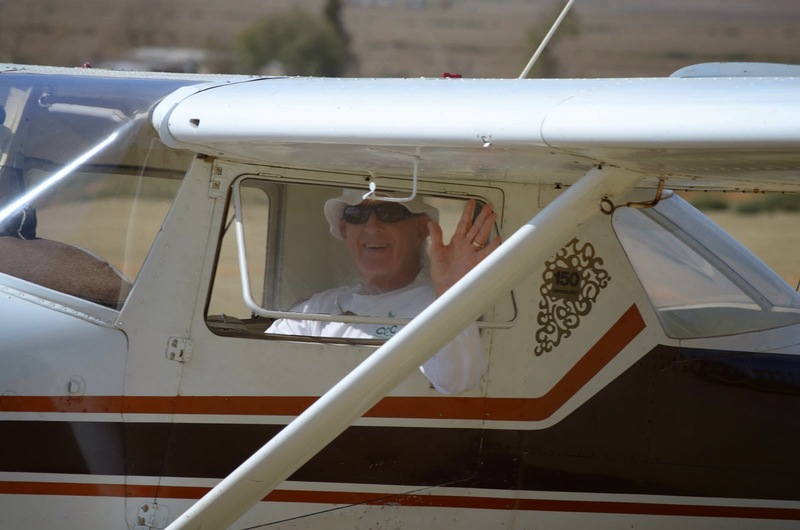 Harold gives a wave as he taxis to get fuel. Martin's refreshed glider is making its first appearance. Martin is connecting control rods. While Tyler was up, his dad commented that he must be having a good time doing something other than pattern work. Tyler had about a 1.5 hour flight and got up over 6000'. Harold gave Dan Clark a checkout in the Club's 1:26 Pretty soon it was time for Dan to try a new bird. Joe Anastasio runs the wing for Dan's second flight in the 1:26. It was 2:37 PM when Dan took off on his first flight. The lift was predicted to end early, and Dan did not find the lift to stay up very long. John Harbick and I launched early with the intent of heading to the coast. With clouds and lift forecasted very far west, I thought it might be a chance to get all the way to the ocean and back. Possibly even crossing the central valley for a Sea to Sierra's attempt. It wasn't meant to be though. Lift was broken and ratty despite beautiful looking clouds. The cycle time on the clouds was very fast, meaning that if you saw a nice looking cloud, you were too late. We pushed over the back from the Power Lines on the ridge and into the Cholame Valley. Under all of the big fat, dark bottomed cu we didn't really find anything. That's a) frustrating b) worrying as "normal" isn't working. So I headed to small, barely forming clouds and began to find workable lift. It was easy until west of Shandon. Then the line got sparse. A few small Cu popped to the South and a very well developed line was to the SW of Paso. Hopping from wispy to wispy, we were soon only 500ft above glide to Paso Robles. About 3 miles east of the airport we finally connected with a climb back to 5k and were able to press on to the SW towards stronger looking clouds. Looking down on Paso, it is amazing how much it has grown over the years. Looks a little too much like LA right now. Looking North from a little SE of Paso. Walmart is in the lower left corner of the shot. Looking South from near Hwy 101. Morro Rock was just visible and the whitewater along Montana De Oro as well. 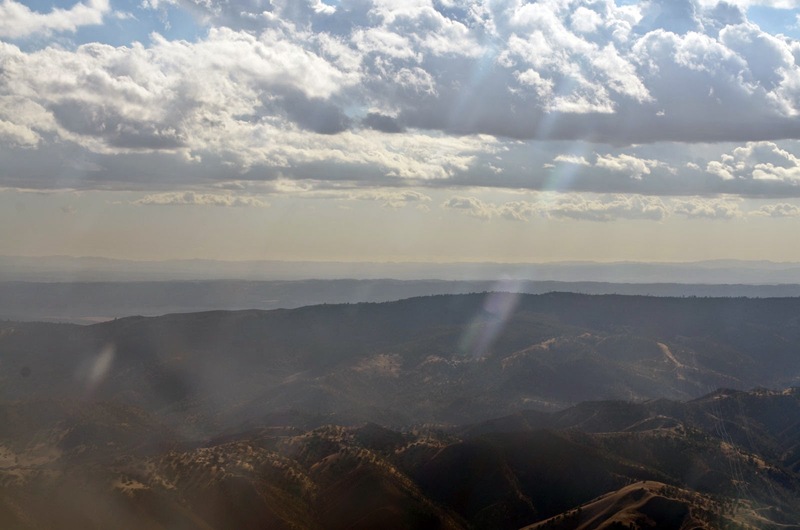 We pressed West out towards Nacimiento Lake, trying to get established along the healthy line of clouds. It really wasn't working terribly consistently though. Finding ourselves too close to the Restricted Area I headed back along the line of clouds hoping to find a better climb. We eventually found something and used that to jump back to Shandon where we connected with the main convergence line. John took over for the second half of the flight. We pressed up the convergence line and over to the NW of Black. Tried a line over to EL5, but once again found ourselves out of sync with the clouds. To the west it was raining heavily and at the same time, our cloud line was drying up. Near the radio towers on the east end of the San Benito's we found a climb back to 7k. From there John got a chance to work us up to the NW and visit EL5, EL4 and Hernandez Reservoir before turning for a fast final glide for home at 100kts. Looking west from near Hernandez Reservoir. Cloudbase to the west of our line was at least 1000ft lower. Typical shelf due to the convergence. Fun and challenging day. The OLC records indicate 45% of our time spent circling which is a much higher number than I usually like to see. The upside was doing something completely different and visiting farther west than is typical. 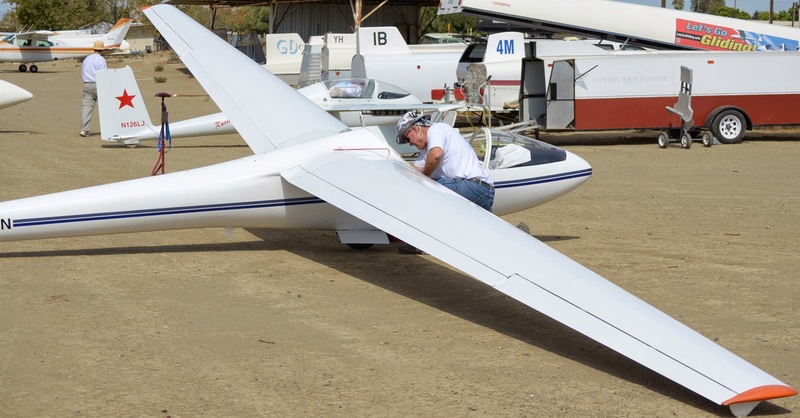 John Harbick gives this back-seat report: Julie wanted to fly her glider, Morgan needed ballast, I was elected. I have only flown with Morgan one other time, two years ago I think. Lift was not where it was supposed to be, all day. CU's were already spent by the time Morgan reached them, and the meager lift came from nowhere really, like in blue sky. Amazing, to say the least. Anyway, Morgan worked very hard for every foot of lift he found, all the way to Paso, and all the way back to just west of Coalinga. I did not want to touch the controls on the way west, or back from Paso. Did I mention 2000 feet MSL at Paso? Morgan is a master of glider flying, and aviation, in general I do believe. I churn butter flying the 2-33, flying the Duo makes me ashamed to say I have a pilots license, as it is so sensitive to control input. I will get better, as this flight with Morgan only makes me determined to succeed. When ever any of you get to fly with Morgan, jump for it, as you will learn, no matter how accomplished you are as a pilot, you will learn. Julie had a 3 hour flight. Richard Walker had a long flight. 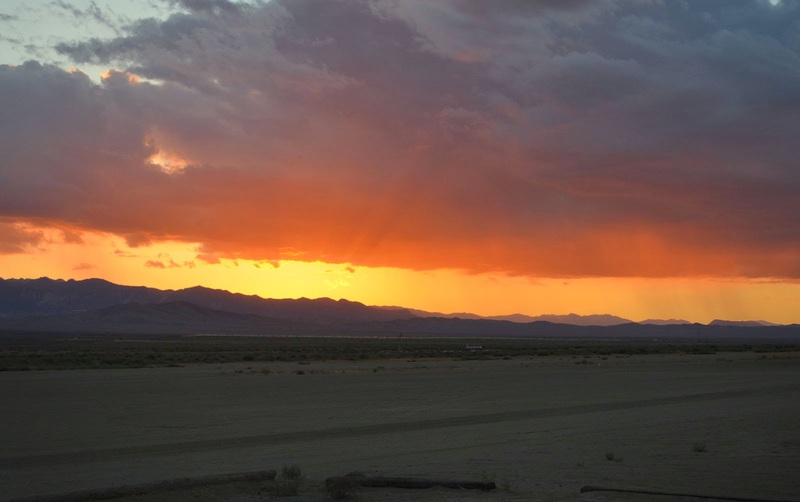 Here is his report: I got off at 2800 in a thermal near tar peak where most people got off. Made it to 3800 before needing to find something else. Finally headed back, got low and hit house thermal as I was orbiting to allow plane to land and see if Harold was launching with a glider. Managed to get back up to 2500 as Harold launched then lost that thermal and headed out again. For the next hour or so I stayed between 2500 and 3500. Worked the convergence between Tar and east to 33. Just couldn't seem to break the 3800 foot level. Fortunately it was a cool day. Had lots of company with the club ships in the area and a couple of birds to share the sky with. 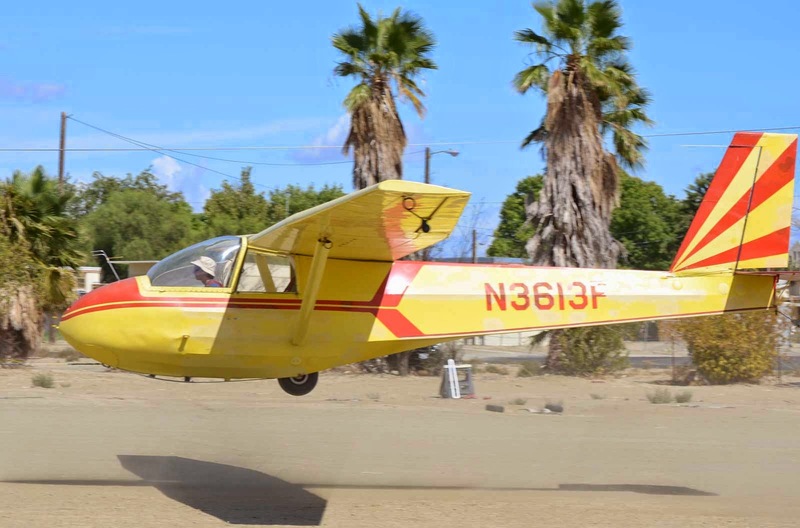 Report from Ethan; I had a nice flight, topping around 7K+ most of the time, and wondering around Avenal north and south. Clouds were cheating more often than not, but I found good lift on the east side of San Benito, and a good line over the Kettleman Hills down to Paramount Farms. Later, also further west near Twissleman North. 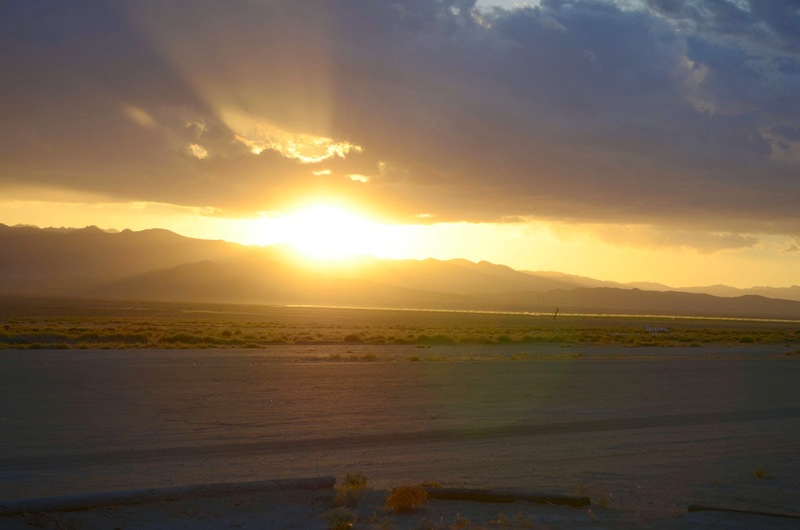 Landed after 4.5 hours, and put YH away in it's warm home, as the sky was painting a beautiful sunset. All in all, nice day, with pleasant temperatures for a change, and even some of us getting a little airborne shower. Andrew Ouellet gave rides to 5 friends today. Once he did not find much lift, and had a short flight, but once he was up for over an hour. 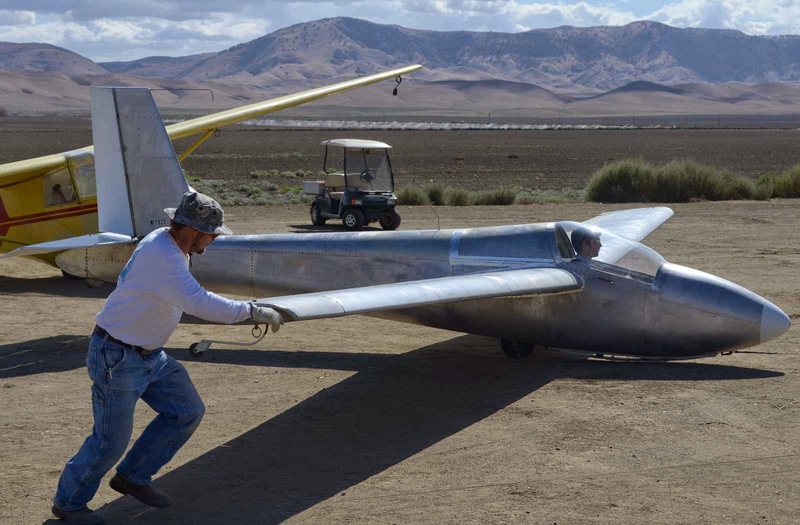 With the commute by airplane and the 5 flights in the glider, Andrew likely had the most time aloft toady of the bunch. 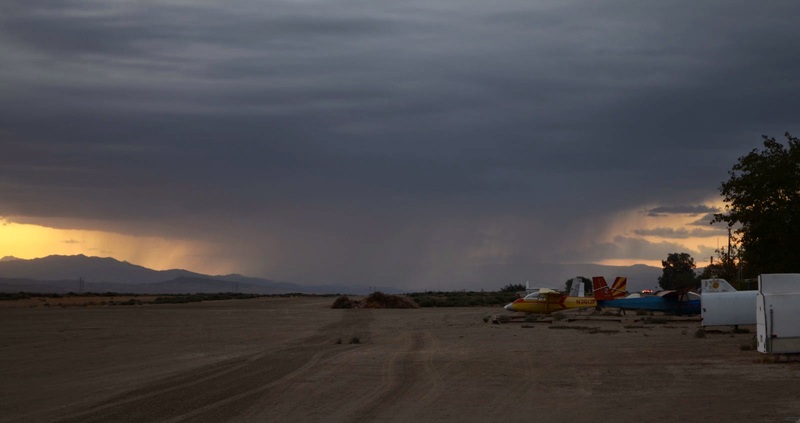 Jim Rickey took Big Bird up for a ride, and here is his report: I talked with Harold in the towplane for a couple of minutes before climbing in the glider, as it had passed 3:00 and conditions were deteriorating. Harold said there was lift out by the powerlines. There was also a lot of sink--sometimes I noticed a descent on tow. By the time we got to the powerlines and above 2000' AGL, the lift was gone. I held on a little bit longer until I was in a 600 fpm climb at about 2400 AGL, and set the towplane free. Found a small area of lift and worked it up to 4600' MSL. I had my sights on the clouds that were forming over the hills to the southwest. If I could get to 5000' MSL and would aim for the nearest one. Wasn't to be. With the prodigious sink that was around, I was not going to aim for that cloud without more altitude to lose. After I touched 4600', I spent a lot of time just going in circles and maintaining altitude ± a little. Decided it was time to try something else, and was rewarded with -600 to -800 FPM. Saw a promising cumulus cloud over the solar farm, but enroute, about a half mile north of the prison, felt a bump under another cumulus cloud that had just started forming. Was able to ride it up to 5550' MSL, and as the lift I was in dissipated, so did the cloud. Well, I had the altitude a had desired to go for the clouds over the hills, but by now the clouds over the hills were fewer and mostly on the far side, so "no-go." Rain is falling to the northwest of Avenal and west of Coalinga. Everybody is now back on the ground. 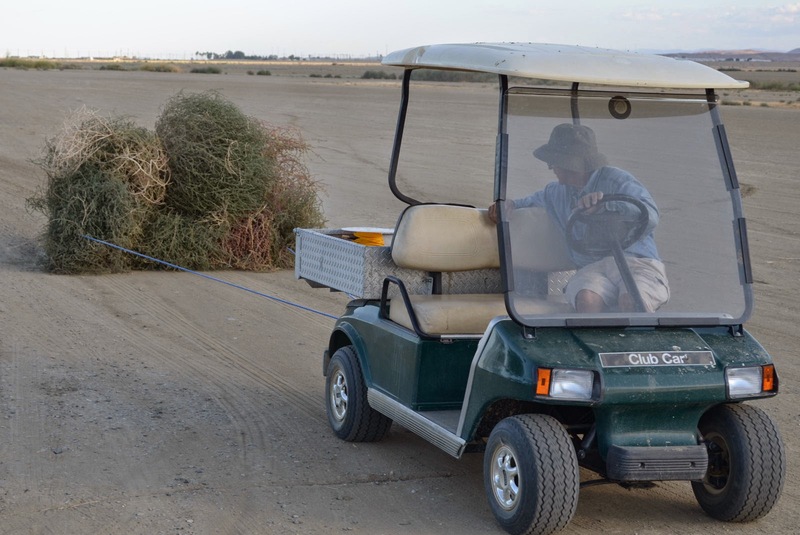 Alex has removed tumbleweeds from around his trailer and is herding them to the tumbleweed pile. 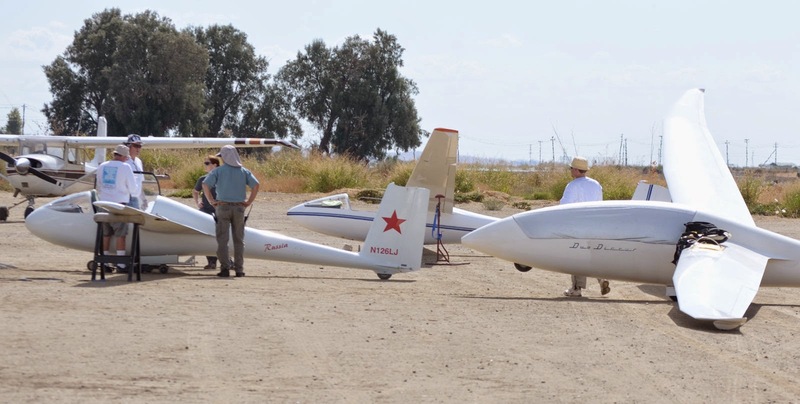 During a debriefing of the day in very comfortable conditions, there was unanimous consensus that the day was a very nice one to be at the gliderport, or even better, in a glider up in the sky. Left to right; Martin Caskey, Morgan Hall, Ethan Ronat, Julie Butler, Alex Caldwell, and John Harbick. 6:35 PM. Sun is setting over the hills. Days are getting shorter. 6:53 PM, shortly after sunset. 7:06 PM. 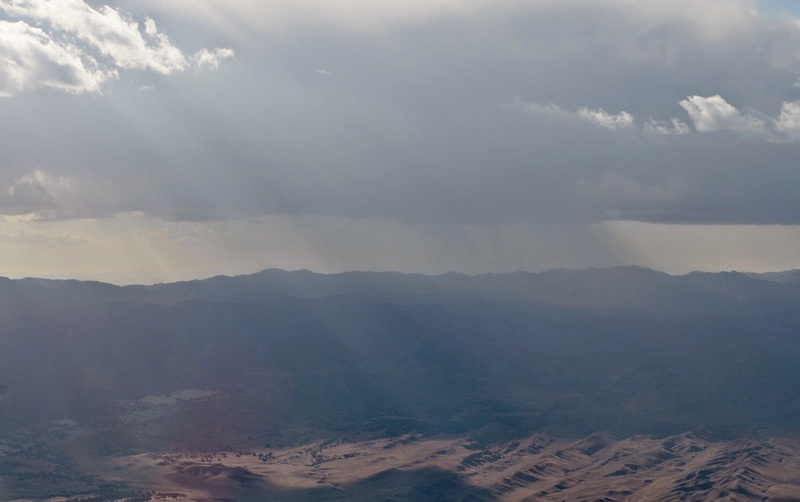 Rain west of Coalinga.